Trust the team with the best materials and the most experience. Once you’ve viewed our gallery and picked out the perfect fence for your home, it’s time to get it installed. That’s where we at Franklin TN Fence really separate ourselves from the competition. In addition to using the finest quality fence materials available in Tennessee, we pride ourselves on our speedy and accurate fence installation services. 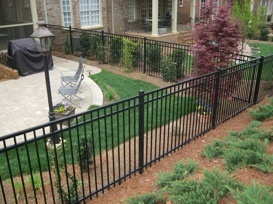 What do you get when you choose Franklin TN Fence for your residential fence installation? We know you have choices when it comes to choosing a company to install your residential fence. If we’re fortunate enough to earn your fence installation business, you can count on the following promises from us. Excellent Customer Service. Our owner, foreman, and crew members are all dedicated to one thing: making sure that you, the customer, are satisfied with your fence installation. Attention to Detail. No detail is small enough to be ignored by our expert crew. All of our lines, edges, and corners will be straight. Experience with Challenging Installs. Dealing with slopes and other difficult terrain, hard ground, strict HOA guidelines, and rigid property lines are all challenges our crew faces everyday. Timely Installation Time Frame. With countless years of experience between them, our crew members have installed a fence or two. That means your fence gets installed in a timely fashion. Thorough Cleanup. We were always taught that you should leave an area in better shape than you found it, and the job site is no exception to that. No job is too difficult for the talented and experience crew of Franklin TN Fence to complete. Still have questions about our fence installation services? Feel free to contact us by calling 615-270-9150 or using the contact form on this page today.